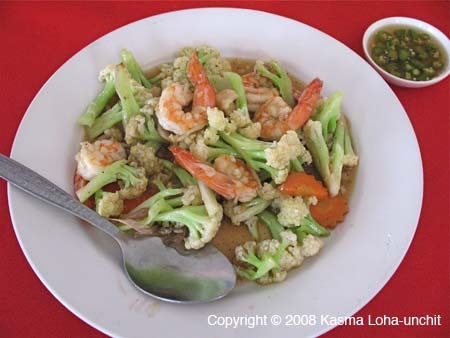 Stir-fried Cauliflower and Shrimp: Stir-fried Cauliflower and Shrimp with Oyster Sauce (Dtawk Gkalum Pad Nahm Mun Hoi Sai Gkoong). Kasma's recipe Stir-fried Broccoli with Thai Oyster Sauce (Broccoli Pad Nahm Man Hoi) is easily adapted for this dish; it is taught in Beginning Series (class 2). Also see her recipe Stir-fried Asparagus, Oyster Mushrooms and Shrimp in Garlic Sauce Recipe (Naw-mai Farang Pad Nahm Man Hoi).